Changing mat and cover There are 3 products. 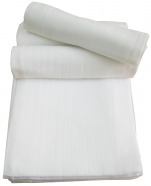 Changing mattress cover 50x75 cm, 80% cotton and 20% polyester terry towel, 200 gr/m². Its universal size fits for most of changing mattresses. Tetra +/- 70x70 cm 100% super absorbent cotton. Tetra used as diaper, bed protection, nursing apron, cushion cover changer, etc. Changing mat 50x75 cm white PVC. 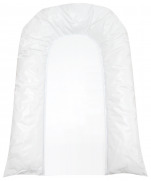 Its universal size fits for most of changing mattresses.